Oil spills and their impact on the environment are a source of concern for scientists. These disasters occur on a regular basis, leading to messy decontamination challenges that require massive investments of time and resources. Seeking a solution, researchers are now studying Alcanivorax borkumensis, a bacterium that feeds on hydrocarbons. 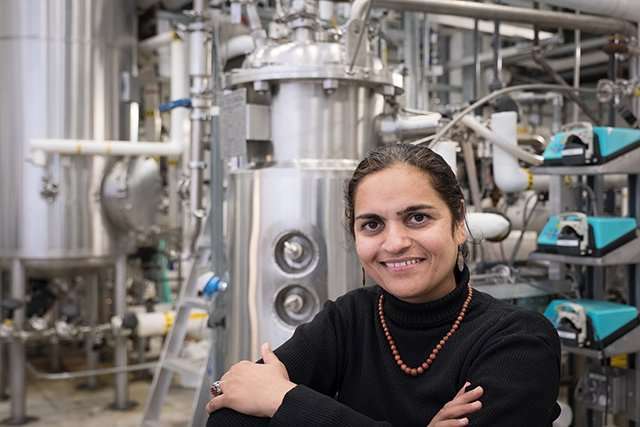 Professor Satinder Kaur Brar and her team at INRS have conducted laboratory tests that show the effectiveness of enzymes produced by the bacterium in degrading petroleum products in soil and water. Their results offer hope for a simple, effective and eco-friendly method of decontaminating water and soil at oil sites. In recent years, researchers have sequenced the genomes of thousands of bacteria from various sources. Research associate Dr.Tarek Rouissi poured over "technical data sheets" for many bacterial strains with the aim of finding the perfect candidate for a dirty job: cleaning up oil spills. He focused on the enzymes they produce and the conditions in which they evolve. A. borkumensis, a non-pathogenic marine bacterium piqued his curiosity. The microorganism's genome contains the codes of a number of interesting enzymes and it is classified as "hydrocarbonoclastic"—i.e., as a bacterium that uses hydrocarbons as a source of energy. A. borkumensis is present in all oceans and drifts with the current, multiplying rapidly in areas where the concentration of oil compounds is high, which partly explains the natural degradation observed after some spills. But its remedial potential had not been assessed. Rouissi says, "I had a hunch, and the characterization of the enzymes produced by the bacterium seems to have proven me right." A. borkumensis boasts an impressive set of tools. During its evolution, it has accumulated a range of specific enzymes that degrade almost everything found in oil. Among these enzymes, the bacteria's hydroxylases stand out from the ones found in other species—they are far more effective, in addition to being more versatile and resistant to chemical conditions, as tested in coordination by a Ph.D. student Tayssir Kadri. To test the microscopic cleaner, the research team purified a few of the enzymes and used them to treat samples of contaminated soil. "The degradation of hydrocarbons using the crude enzyme extract is really encouraging and reached over 80 percent for various compounds," said Brar. The process is effective in removing benzene, toluene and xylene, and has been tested under a number of different conditions to show that it is a powerful way to clean up polluted land and marine environments." The next steps for Brar's team are to find out more about how these bacteria metabolize hydrocarbons and explore their potential for decontaminating sites. One of the advantages of the approach developed at INRS is its application in difficult-to-access environments, which present a major challenge during oil spill cleanup efforts.